This is the first of my weekly reviews of sparkling wines under $10 up until the big twenty-fifteen NYE! If you have a recommendation, let me know in the comments and I’ll do my best to review it if I can find it in aisle. All wines tasted are selected, paid for and tasted by moi and my unsuspecting victims. All opinions are my own damn fault. The Place: The in-laws’ home in an unassuming nicely appointed suburban neighborhood rife with 2 car garages and golden retrievers. The Reason: It is Thanksgiving, an American holiday where we express our gratitude for our family, friends and freedoms through fanciful forced feasting on fowl. My Predicament: Due to family members honoring years of sobriety, diagnosed with fatty livers, participating in designated driverdom, not of legal age, and a general distrust of alcoholic libation, I am the solo drinker. And it is sooooo lonely. Argh. You can only drink so much Martinelli fizzy apple juice before you crash from the sugar high, so what should I do? The Solution: Break out some bubbles and proclaim my vocational duty to conduct a random wine tasting that all (domesticated animals, toddlers and recipients of newly transferred livers excluded) must participate. I was not surprised when my demands were met with enthusiasm. Woot, woot let’s get this party started Gma! Put that gravy boat down. “Pop!” Let’s taste some sparkling wine! The wine I selected came recommended by a wine department official at Oliver’s Market in Santa Rosa. I have been searching long and hard for sparkling wines under $10 that don’t cause a ripping headache. He kindly recommended a Cava. I grimaced. Apologies, but I will confess, bubbly is my passion and I am a Champagne snob. I am not a huge fan of Cavas. I find them to be rather tart with a bitter nutty finish that reminds me of walnut skins and nail varnish. I expressed this to my wine merchant and he assured me that I would love this wine. Well, love is a very strong word, but I let him know that I would be cautiously optimistic. And for $9.99 I was comfortable with the risk. 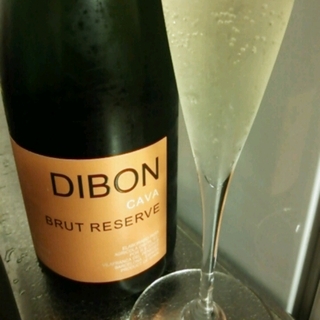 Dibon only uses natural yeasts for its Cava production and is in the process of becoming fully organic. It consists of 75 hectares of trellised vines 1000 feet above the Mediterranean Sea. The region of Penedes in Spain is considered the capital of Cava wines. Sant Sadurni d´Anoia is the primary municipality in the region and the home to many famous historical Cava makers. Dibon is located in Vilafranca del Penedes, aproximately 20 Km from Sant Sadurni. A must see next time I am in Barcelona, as the mecca of Cava is very close and could be visited in a day if necessary – but I aim to boondoggle much longer if given the chance! 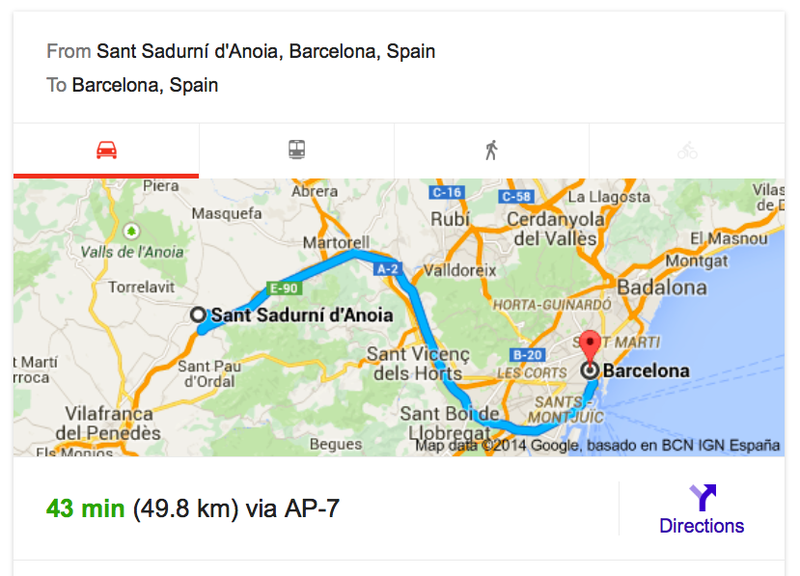 A Google Map to illustrate my point about proximity and convenience to Cava-land. As our painfully sober family gathered in the kitchen to see, sniff and sip – right after the first swig, we all agreed, this was a very good sparkling wine! Nose was light, apricot, stone fruit. First sip was bright, apple, with an almond, nutty finish. I thought the wine was very balanced and had a medium mousse that pleasantly finished with some minerality – not much but enough that I noticed and enjoyed it. It has a body that is characteristic of a Cava but none of the bite I detest. I don’t mind a wine that has challenging characteristics, but I prefer to keep the enamel on my teeth. If participating in a blind taste test, I don’t think I would correctly identity this wine as a Cava, I might describe it as a California sparkling, like a Gloria Ferrer (which was founded in Sonoma by a Catalonian family in the 1980’s and now owned by Freixenet, one of the worlds largest Spanish producers of sparkling wines in the world.) This Cava was a Chameleon and in a very good way. Guest-worthy for sure. A fantastic sparkling wine for the money, Dibon Brut Reseva was fab not only for the price but as a wine, yes, this wine has merit. Perfect as an aperitif, paired with a light starter like goat cheese and roasted beets, mâche salad dressed simply with toasted walnut oil and a dash of good sherry vinegar, or shell fish with mignonette. This is a delectable versatile wine that is both approachable and interesting. In my research I read several good reviews from the Wine Enthusiast, Wine & Spirits Magazine, and Wayward Wine Blog – after you read my review for yucks, read his for legit information – he has charts and stuff. Any resemblance to plagiarism is merely coincidence, but great minds do think alike. How did this wine pair with Thanksgiving dinner? I don’t know, the bottle was empty before the potatoes were smashed, which was a good thing as I believe they were driving. You come and go….you come and go-o-o-o! You had me at the title! Love it and look forward to your weekly sparkling reviews! Love the title! Sparkling reviews until NYE? Can’t wait. Now I can’t get that song out of my head. And I desperately want it out of my head…. Dance it off Jeff, dance it off. There is some fabulous Cava available at great prices theses days. Try some Raventos if you get a chance; they have recently taken themselves out of the Cava DOC but are making superb fizz! Thank you sir. I am on the hunt. Cheers! Oh I meant every word I said 🙂 and the thought of Dr. Kralik dancing to that song makes me LMAO!